Sunday breakfast complete with hash browns. When I was pregnant I craved hash browns daily, so I became an expert. Here is an easy recipe, which is about getting the starch out of the potatoes and then getting them as dry as possible. Peel the potatoes. Grate them on a box grater or in a food processor with a shredding blade. Place them into a strainer immediately and run under cold water so that the potatoes don’t oxidize and to get the starch out. Run until the water is clear. Shake them around and then press the potatoes with the back of a spoon to get any remaining water. Heat a thin layer of oil in a non-stick skillet. Add the potatoes and flatten them out with a spatula. Let them cook for a few minutes until browning on bottom. Flip them over, cutting into a few pieces if necessary. Enjoy! 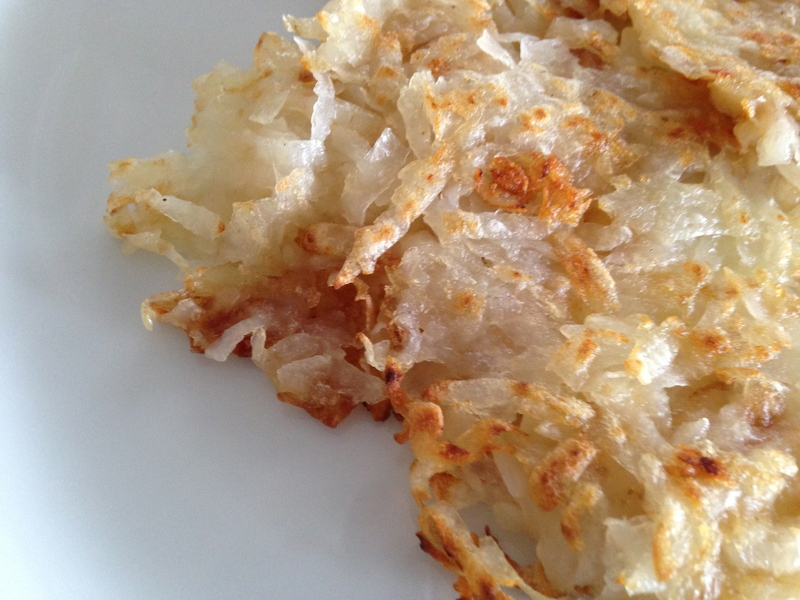 I had hashbrowns a lot in pregnancy too…I had them starchy…I kinda liked them that way, but I don’t eat hashbrowns anymore so I’m not sure if I’d prefer your perfect version or the way I remember eating them. why don’t you eat them anymore?! Well…I don’t really eat oil anymore, I eat mostly raw and I’m not sure how to make them without oil. I love hash browns! I use rice bran oil for high heat oil 🙂 It is really good for frying!